Happy Monday! It's been quite busy the last couple of weeks! I feel like I say that all the time followed by "hopefully it will settle back into normalcy soon." Those are my exact sentiments at the moment. With the wedding last weekend, I wasn't quite thinking about having to squeeze in blog photos last Sunday, and there was no way I was going to be able to do that in the recovery state that I was in. Luckily I had some other non-outfit related posts that I wanted to share with you that filled my content for last week, but I still felt bad (and missed) sharing proper outfit photos with you! 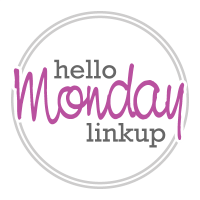 All that said, I am back with a vengeance this week so let's just jump right into it! First, these flares. If you recall, I found the perfect pair of flares a few months ago. Actually, looking back at this post, it was over a year ago! That pair was really fabulous, but fitting a bit on the bigger side now, so they needed to be replaced. I found this pair online at Express and I was immediately intrigued because they have a pull-on waistband. Yep, no button or zipper. I ordered a different size first and had a little try-on session via Snapchat. I wasn't 100% sure about them. The majority of the replies I received urged me to keep them, though there were definitely a few people who admitted that flares just aren't their style. And that's ok! After years and years of skinnies, it's definitely hard to adjust to this silhouette. Even pulling them on, there just feels like there is SO MUCH FABRIC! Ha! Alas, I decided to size down, because while that pair fit, I knew after one hour of wear, they'd be stretched out and a bit baggier fitting than I was comfortable with. The size down definitely worked a lot better. I felt like they hugged my hips and thighs better. The pull-on style is pretty great, I can't lie. I have another pair of pull-on jeans from Express and I really wanted a second pair. These weren't the second pair I originally intended on purchasing, but I'm still smitten with them. Naturally, I had to make sure I had a pop of color peeking out from under the hems. I took these photos yesterday (Sunday), and I had painted my nails late Friday afternoon. I tell you this because my nails still looked as good as day 1, and I couldn't be happier. 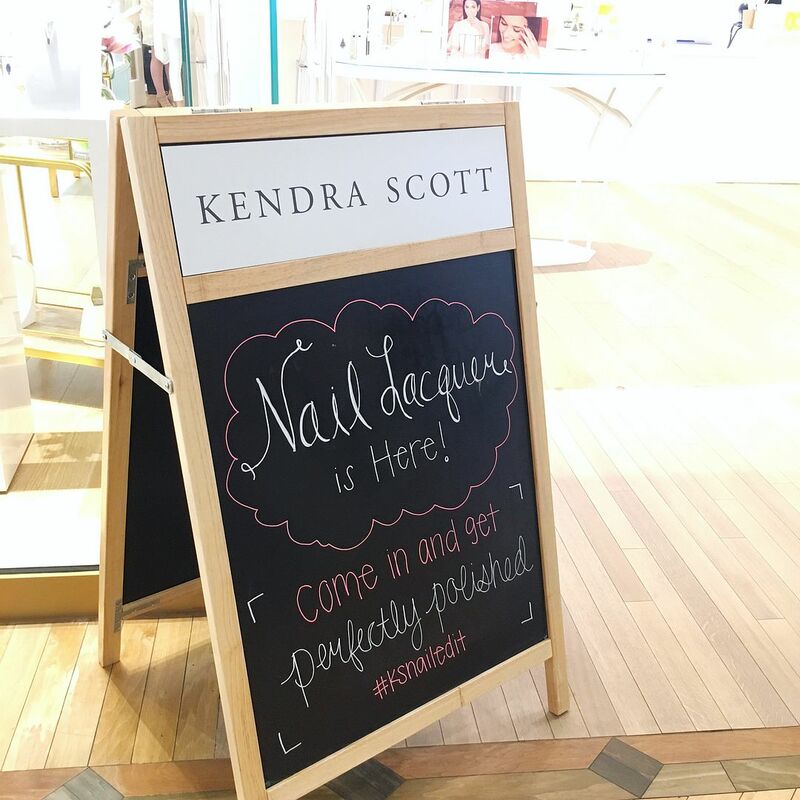 You see, last Friday, Kendra Scott released Nail Lacquer! They had mentioned this a few weeks ago to me while I was previewing the fall collection, and I've been impatiently waiting for them to be available ever since! My Kendra Scott rep emailed me last week letting me know they'd be in and asking if I wanted to partner with them on this. Um, YES! Thanks to the New Year's Resolution I made a couple of years ago, polish is now a permanent fixture in my daily routine. I hate having bare nails or chipped polish. There's just something about a painted nail that makes me feel complete! Nowadays I think that Essie is my most dominant brand I wear, but I do have OPI, Orly, Butter London, Zoya, and Chanel in my collection. I've been very anxious to see how Kendra Scott matched up to these! 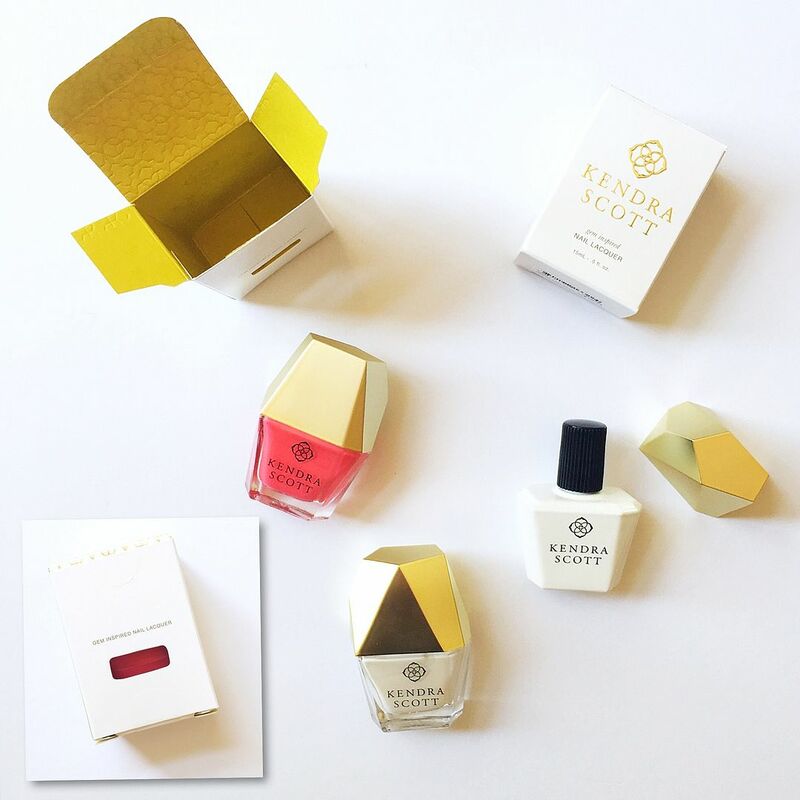 Kendra Scott's Nail Lacquer lands in the same quality category as Butter London, which also means a similar price point. While it is made in the USA, it is "5-free" which means it is made without the 5 toxic chemicals (formaldehyde, dibutyl phthalate, toluene, formaldehyde resin, and camphor) normally found in a lot of other polish. All of the colors are inspired by the gorgeous jewel tones you've come to know and love about Kendra Scott, and HELLO, the bottle is freaking amazing! All of the colors are sprinkled throughout the store, perfectly coordinating with the jewelry. I was torn because I wanted to buy ALLTHECOLORS but also wasn't positive which ones they would be gifting me, so I had to be patient! All of the sales associates were wearing a metallic color of some sort, which were rich and saturated in color. I ended up with Bright Coral, Bright White, and the Gel Top Coat. I did not waste time trying everything out. We were meeting his family for dinner Friday night, and since my previous color was chipping, I went ahead and applied the Bright Coral before we left for dinner! I literally had 10 minutes to get this done, and it all went on easy breezy. I received a question/ comment on Instagram asking me if I felt awkward holding the gold cap while I painted my nails because she had difficulty with it. The great part is that the gold cap can easily slide off if you prefer to hold the basic black cap underneath. I tried using both caps and didn't have trouble holding either of them. The formula is nice and thick, but still very fluid so it goes on nice and evenly. One coat provided a sufficient amount of opaqueness, but I always apply two coats of color regardless. I am really picky about my top coats. I've tried several of them now. Seche Vite was my holy grail for awhile, but after my second bottle, I needed a break. The formula was so thick, I would end up with entire fingernails of polish coming off accidentally. I then tried the Essie Gel Setter, but didn't like how long it took to dry and set. It may feel dry to the touch, but it was still tacky and sensitive under the top coat and I'd end up with dings and dents in my nails. I tend to paint my nails right before I'm walking out the door, so it's important for me to find a top coat that dries fast with the most protection. Kendra Scott's top coat definitely meets this criteria! Plus it's not super thick and gooey, it's just right. Kendra Scott Nail Lacquer: Bright Coral (c/o) | Double Ring: Kendra Scott "Odette" | Midi ring set: Kendra Scott "Miles" | Bracelet: Kendra Scott "Candice"
While this is the third day of having the Bright Coral on my nails, I'm torn. I want to see how many more days I can go without a chip, but I also want them to chip asap so I can try out the Bright White! Ha! I've been posting updates on Snapchat, so you can continue to follow along there, and I'll try to formally document more updates on the blog as well. Oh, I should also add that I ended up ordering Rose Quartz and Chalcedony over the weekend. I couldn't resist! The results have been good so far, and you guys know how I love my multiples! Oops! Anyway - thanks for hanging in there with me on a longer than normal post! Have a great week! That nail polish sounds awesome too - and I like that bright colour on your nails. I can't wait to see the rose quartz! 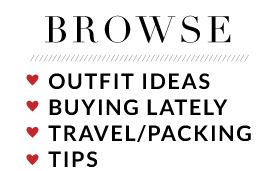 That's on my need list for sure, ugh I should just give all my monies to Kendra Scott. Also, love the strappy bralette! super cute. you look so tall with the flare, love the peep of red. Ok I think you convinced me to try the KS polish they have a nice red I want. 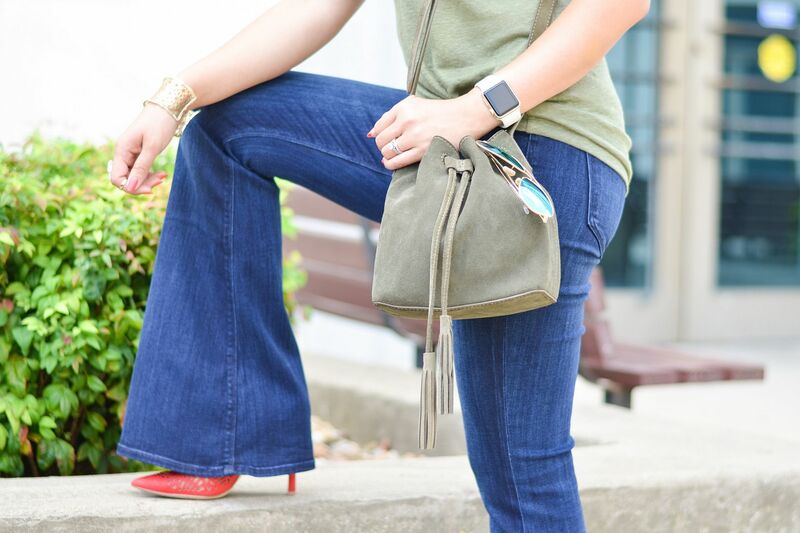 Loving these new flares and dying over that bag! You have got me excited for fall with this look. Those polishes are amazing. Perfect packaging! Love that top and flares on you! 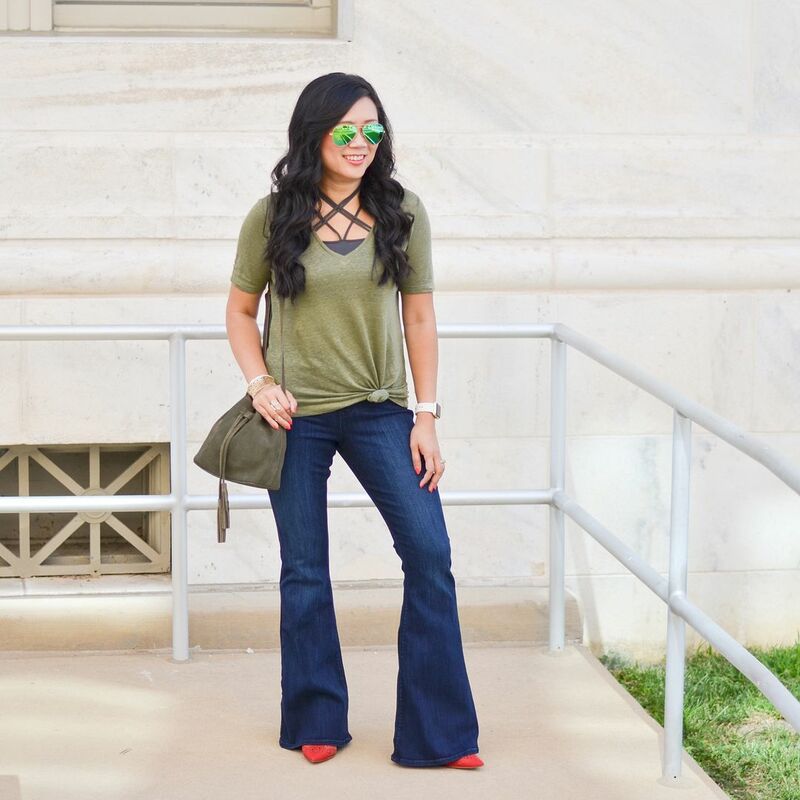 LOVE your flares! 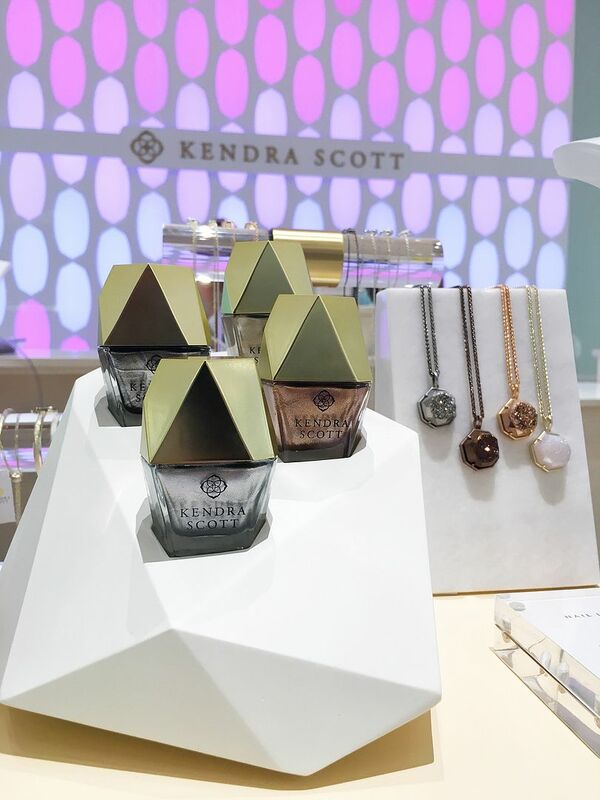 And I'm excited to try out the new Kendra Scott polish! I've got my eye on that rose gold color! Love love love this look! You styled this perfectly! 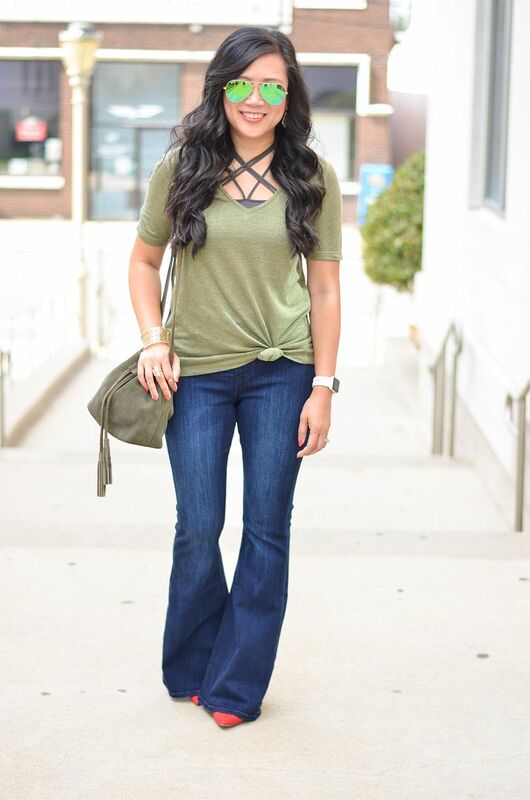 I am loving the flare jeans! And those heels are spectacular. The color combination of bright shoes with the olive top is perfectly autumn! I have not tried gel polish myself at home...but you are tempting me to give it a try! 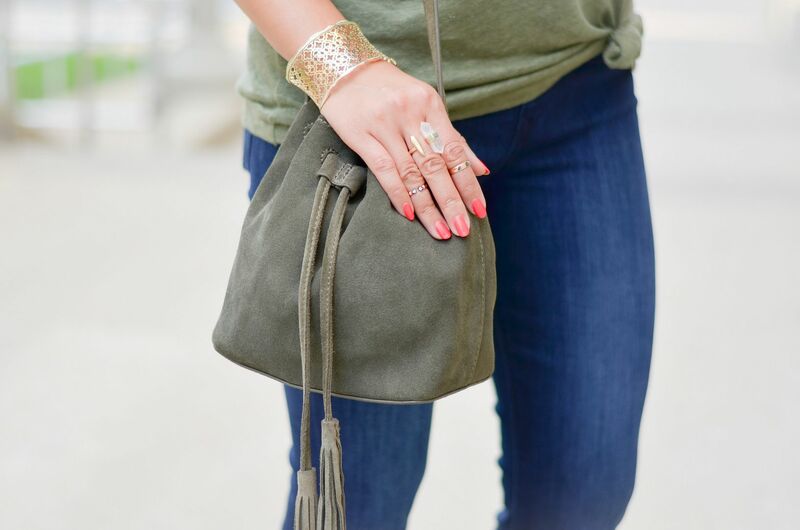 I love the layering you did here--the straps are so fun under the olive tee! 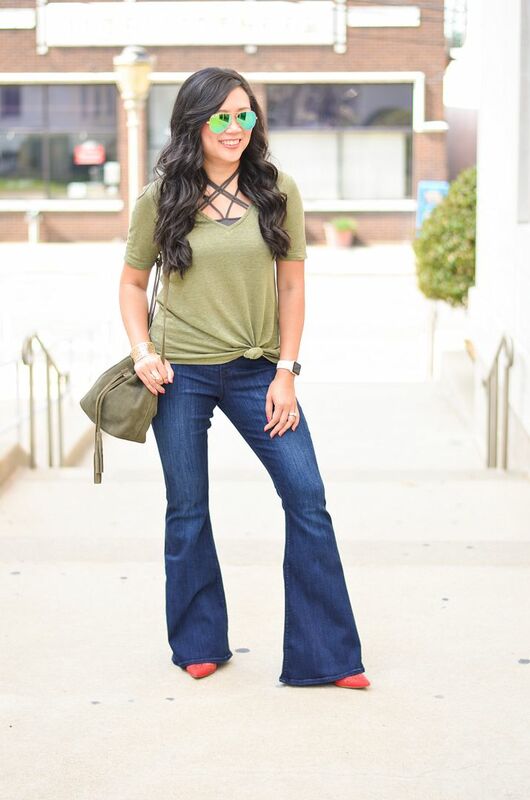 While I do love my skinnies I love the look of flares too--it's fun to have a different option to choose from. They make your legs look so long!! I think you look amazing in the flares! I love having an option other than skinny. Such fun nail polish too! I just ordered a pair of flares---I'll need to experiment on how to wear them...because like you said, I'm so used to skinnies!! I think these look fabulous on you!! I think flares are a nice change from skinnies once in awhile. I like to change up my jean styles. Love the nail polish! And that bralette looks fabulous under the tee! Love your bralette, I have been wanting to pick up one, I love how it elevates a basic tee. Those jeans look amazing on you!! I understand the feeling about nail polish... it just doesn't look complete! Love this look, head to toe! 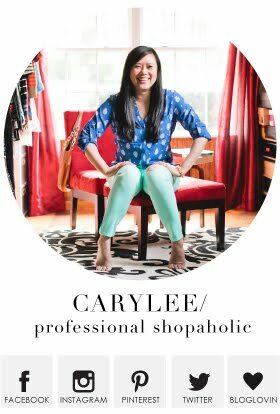 The color of your tee and bag are beautiful, love the bralette, and obsessed with your bag! 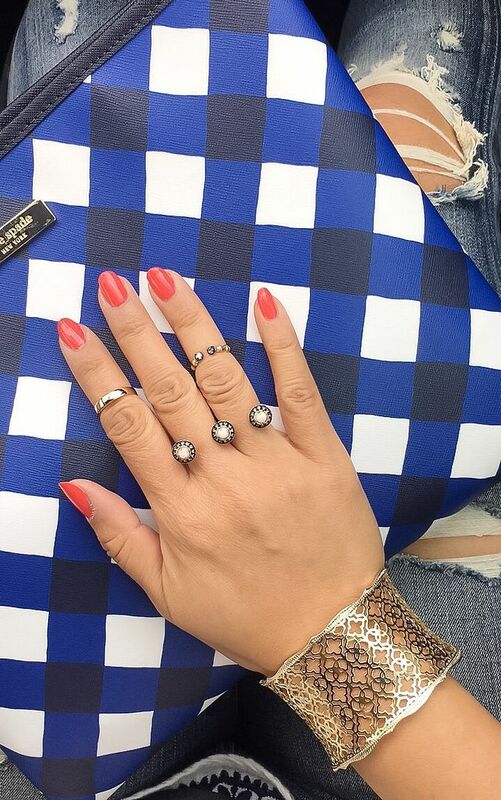 Those flares look great on you and you know I love that mani! Stunning outfit and polish, perfect fall look. Beautiful color and mani, and I am really hip to the flares this fall! Just bought a pair myself. Love yours and have to check out the pull on style! Love the flares and that little peak of red from your heels! Great early fall look! I love that color green with the red! Cute early fall look! I have the Kendra Scott nail lacquer in Bright White and Platinum Drusy and I cannot wait to get more colors! I'm a huge Essie fan, but #KSnailedit! I didn't know that Kendra Scott made nail lacquer. They look amazing! I was hesitant with the whole bell bottom thing coming back in, but you really rocked this look! I love that flares are coming back. I feel like they make you look so tall! I really like this pair on you and the pop of color from your shoes! YES TO FLARES!! PUHHRAISE JESUS!! Oh my gosh! The Kendra Scott packaging IS freaking amazing! I'm a sucker who would buy it just for that, hahaha. I love the coral color your picked, and I'm so happy to hear that it works so well! Can't wait to try it! Also loving your flares - they are SO flattering! And the bralette, and the tee - okay I'll stop. Such a cool look mixing the bralette with the top!! Love your sunnies as well!